"Celebrating The Unity Of Love"
Rev. Jonathon Miller, M.A., M. Div. "You really did a nice ceremony for us, and I will never forget the day. . . . I appreciate your considering me for officiating your wedding. I am an ordained minister and a graduate of Hartford Seminary (Hartford, CT), with both a Master of Arts degree in religion and a Master of Divinity degree. I have been a church staff member for many years, and I perform music and speak at a variety of churches. I have been registered with the State of Ohio to officiate marriages since 1978, doing creative weddings for about 40 years. A wedding is a precious event in one's life, and I do my best to help you have a wonderful wedding service at a very reasonable cost. I give you the opportunity to create just what you will like for your marriage ceremony. You can select or write passages and put together a unique ceremony of your choice. Your ceremony will be in capable hands. I make sure the presentation runs very nicely so you are not stressed, and so you and your guests can fully enjoy the special event. If a rehearsal is needed, I can help you conduct that efficiently as well. No pre-marital classes or counseling are required, although counseling is available upon request. 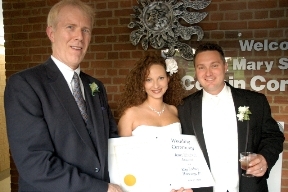 You may have your wedding at any Ohio location within reasonable driving distance of Akron. 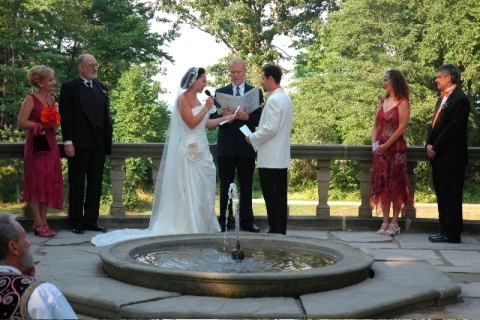 I have done weddings in many settings over the years: churches, homes, gardens, gazebos, parks, fields, woods, lakes, halls, banquet rooms, historic homes and grounds and most of the popular facilities in northeastern Ohio, including on boats, on horseback and even in a hot air balloon! You will need to get a marriage license from your county probate court no sooner than 60 days before the wedding. (The license expires if there is no wedding within 60 days of acquiring it.) After the ceremony, I complete the documents and return the part that goes to the court. I am also a singer and guitarist, and I have performed at many weddings over the years, with several great songs to choose from. One or more songs can be done beforehand, at the start, or at some other point in the ceremony. It's just an option -- a singing minister -- something different! Below is a sample wedding format. Everything is optional except there should be some kind of vows and pronouncement. I would enjoy working with you to create a unique ceremony that you will really like. You are welcome to write passages yourselves, such as your vows, or something to say to or about one another in a "Time of Sharing". A couple of popular options are listed in the sample format, including the Unity Candle. 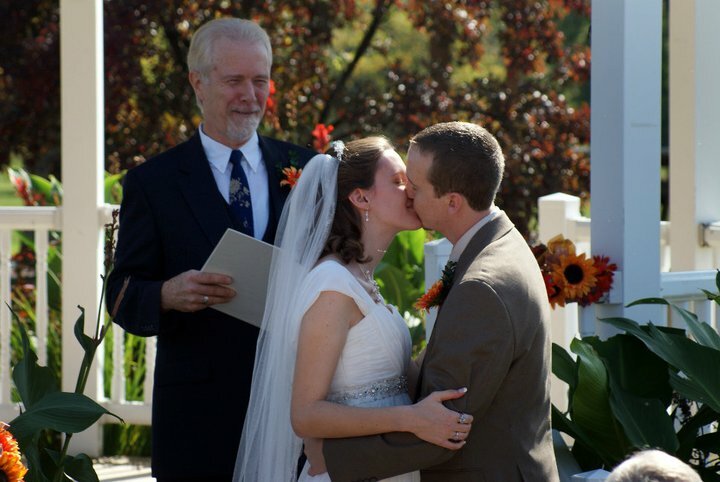 My ceremonies are non-denominational, usually with a mixture of modern and traditional elements. I also have a very traditional ceremony for those who would prefer that wording. 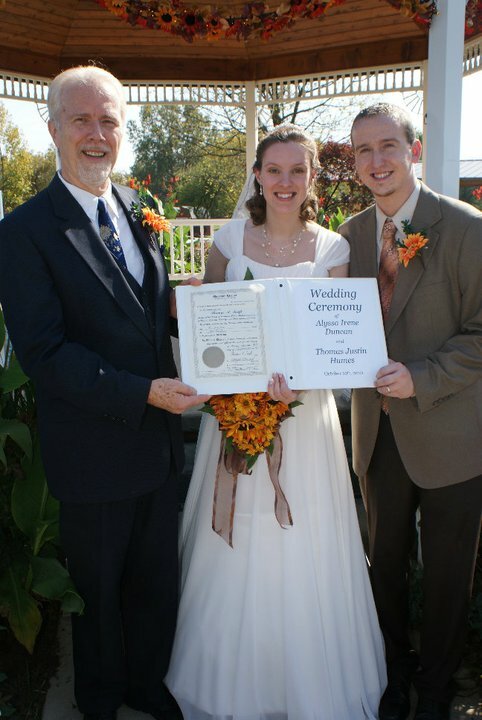 I will type up the ceremony we create, put it in a nice notebook, use it for the wedding, and then present it to you as a keepsake after the service. John and I wish to say thanks for performing a wonderful marriage ceremony for us. Our families and friends were quite moved and impressed by the words we and you spoke. Your singing and guitar performance was very much enjoyed by everyone. Working with you to make our ceremony meaningful and memorable was a pleasure. We shall recall the Marriage Commitments as we move through our life together. Enjoy the enclosed photos and remember us along the way. Thank you so much for making our rainy day shine! Thank you for all your help preparing for the ceremony! We will always remember this day and your part in making it special. We received comments from all our guests about the beauty of the ceremony. Thanks again, Marcus & Beth Mitchell "
Thank you so much for making our ceremony so meaningful & memorable. Everyone commented on how the words were so thoughtful & special. Gary and I want to thank you so much for our ceremony; it was so beautiful and what we both wanted. Your song that you sang for us was amazing. We couldn't ask for a better wedding than we had. Even though we were rushing to get everything ready it still went wonderfully. Our memories of our unique and beautiful wedding will always be remembered in our hearts. A special thank you for helping our wedding day go perfectly. Michael and I received the ceremony we dreamed of and had many compliments on the ceremony as well. Thanks for all you did for us. Sincerely, Michael & Crystal Vignon"
Pat & I just wanted to sincerely thank you for performing our wedding ceremony. -- It was just exactly what we wanted, and we were so pleased with your service! 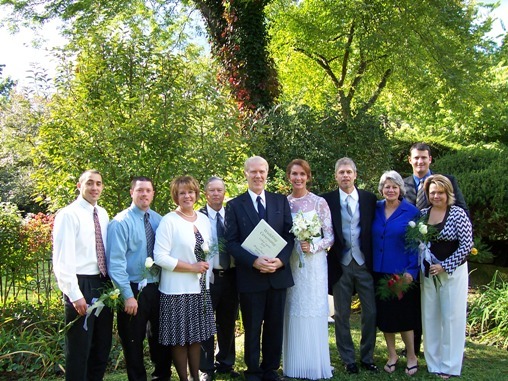 Sincerely, Pat & Lisa Pace"
"Thank you so much for putting together such a beautiful ceremony. You made our day even more special. Sincerely, Tonia & Ray Morris"
Thank you so much for officiating our ceremony. We were amazed at the options offered to customize our ceremony for our needs and preferences. You did a wonderful job and are an eloquent speaker. We had challenges with a short window of time, let alone living in Germany. Your assistance in making our wedding all it could be is very appreciated. I Corinthians 13: 4-8 -- "Love is patient; love is kind; love is not jealous or boastful; it is not arrogant or rude. Love does not insist on its own way; it is not irritable or resentful; it does not rejoice at wrong, but rejoices in the right. Love bears all things, believes all things, hopes all things, endures all things. Love never fails . . . ."